Tufpak | Autoclave Bags | Manufacturer of Specialty Engineered Plastic Film & Bags | TUFPAK, INC.
Tufpak is the original manufacturer of Autoclave Bags to industry. Autoclaving (Steam sterilization) is the most efficient and economical wet thermal disinfection process. Hazardous waste producers in research and clinical laboratories rely on this process to continually meet their obligations to Federal and State regulations. 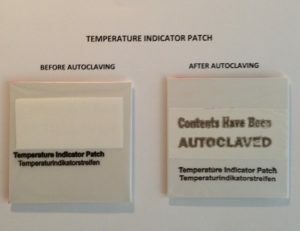 Autoclave Bags differ from everyday use bags because of the temperature resistance they have to maintain, and the strength requirements imposed by Federal Regulations. There are also other non-hazardous applications where Autoclave Bags play an important role to assure that contents have been sterilized. 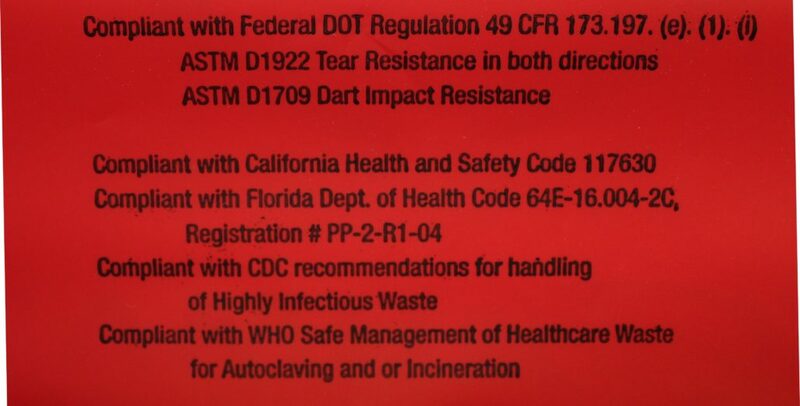 Compliant with Federal DOT Regulation 49 CFR 173.197 for HazMat Handling and Markings. They exceed the 480 gram tear test as defined by ASTM D1922 in both length (MD) and width (TD) directions. They also exceed the dart drop test of 165 grams defined by ASTM D 1709 in this federal regulation. Every bag has this information printed on it. Our products physical properties have been re-affirmed and certified with an Independent Testing Laboratory. 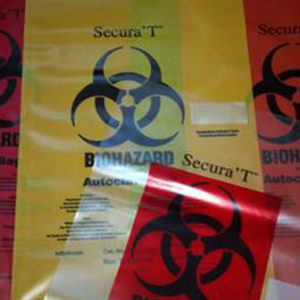 All Biohazard bags have OSHA required markings from Regulation 29 CFR 1910-1030 printed in 4 languages (English, French, German and Spanish). All Biohazard bags Compliant to EPA Resource Conservation and Recovery Act (RCRA) statute Cradle To Grave requirements 40 CFR 262. 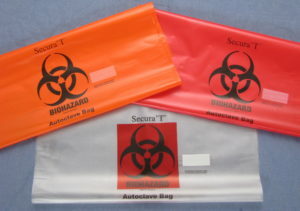 All Biohazard bags have a Temperature Indicator Patch that actually spells out “CONTENTS HAVE BEEN AUTOCLAVED” after exposure to wet steam heat and autoclave pressure to visually show bag has been processed. Autoclaves use pressurized steam, heated to 121-135°C (250-275°F). To achieve sterility, the target is heated in a sealed pressure chamber that creates steam until the article reaches a pre-set time and temperature point. The article is held at that set point, which varies depending on the bioburden present and its resistance to the penetrating steam to sterilize. Recommend that bioburden tests be performed in bags on a scheduled time frequency to assure processing consistency validation and sterility. Add ½ liter of water to bag prior to putting in autoclave. Bags need to be able to vent steam; best practice is to close off by putting a test tube (or round dowel) in top and wire close, remove test tube, place in autoclave with wire closed end up for good ventilation (do not stack bags on top of each other in autoclave). Check with facility safety officer about spore kill testing requirements in your local, State or Country region. Bags are available in 4 stock colors RED, CLEAR, ORANGE and YELLOW and 2 custom colors of BLUE and GREEN. Custom Printing is available with minimum purchase requirements. Tufpak would be pleased to discuss your specific product application needs. Use this Contact Us e-mail hotlink or phone numbers listed below. We look forward to hearing from you.